Retail Price $109.99 0 0 Like this product? The Coby KYROS MID7034-4 tablet is a powerful and flexible internet and entertainment solution with a 7-inch resistive touch screen and intuitive Android 4.0 operating system. Connect to the world with the touch of a fingertip. 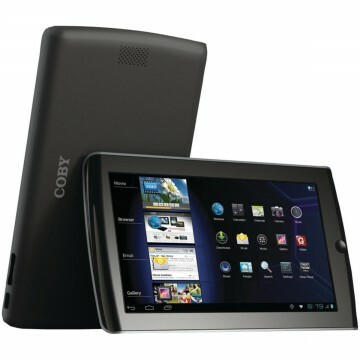 With sleek and stylish Coby tablets you are able to relax and enjoy your favorite content. A great gift idea. The Android 4.0 (Ice Cream Sandwich) operating system is the latest version of the Android platform for tablets and more. It builds on the things people love most about Android: easy multitasking, rich notifications, customizable home screens, resizable widgets, deep interactivity, and powerful new ways of communicating and sharing. Resistive touchscreens work on the basis of pressure applied to the screen. A resistive screen consists of a number of layers. When the screen is pressed, the outer later is pushed onto the next layer — the technology senses that pressure is being applied and registers input. Resistive touchscreens are versatile as they can be operated with a finger, a fingernail, a stylus or any other object. This screen is accurate to at least display pixel resolution, as can be seen when drawing or writing characters with a stylus, making it useful for handwriting recognition and interfaces with smaller control elements. The Coby tablet allows you to do the little things you love - shop, check the weather, get recipes, keep in touch with friends and family, and keep up with the constantly changing stock and news. The built-in music app lets you swipe and tap through your music by artist, album, song, or playlist. Listen to your favorite tunes at home or on-the-go. Surf, watch, play, and do whatever you want, wherever you want. Coby tablets connect quickly and easily to Wi-Fi networks. Support for Wi-Fi Direct lets you connect directly to nearby peer devices over Wi-Fi, for more reliable, higher-speed communication.